I've been wondering this for a while, since I constantly read that using another scoring method "rarely" changes the end result of the game. What is a situation where someone wins by one method, but loses by another method? In all the examples I've looked at, the specific number of points is usually different, but the difference between white and black's scores is exactly the same. White wins by 0.5 points under territory scoring. Black wins by 0.5 points under area scoring. This example is extremely artificial since the komi is 0.5. With area scoring usually the komi is an odd number plus one half (e.g. 7.5 instead of 6.5). This example is the reason why, 0.5 komi will almost allways give the same winner as -0.5 komi. For a better exmaple, remember that points in seki count in area scoring but do not under most territory scoring rules. Under territory scoring the points don't count for White and so White has 10 points but Black has 11. 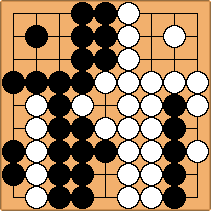 Under area scoring White has 40 points (12 territory and 28 stones) while Black has 39 (11 territory and 28 stones). The most obvious difference between area scoring and territory scoring must be the fact that after all the points are taken, under area scoring you can play inside the territories with abandon; there will not be a penalty for defending needlessly, nor will you be punished for trying something so silly inside your opponent's territory, that a pass is a good enough defense. Under area scoring, it is sometimes possible to raise the stakes in the final ko. When this possibility occurs, the player that tries to gain the extra point will have to treat every dame played by the opponent as a ko threat, and still be able to win the final ko. With territory scoring, there is nothing left for black but to take the ko and connect it, and suffer a defeat. With area scoring, however, black has a chance. 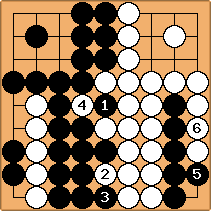 Even under area scoring, if black does not realize that he can leverage his extra ko threat, he can not win because of the 1.5 points komi. If black makes full use of his ko threat, he can win under area scoring. After there are no dame left, so the player without ko threats cannot claim the one point usually available for the player who loses the final ko. 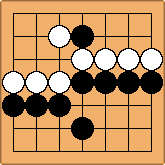 Therefore white has to pass with , while black connects the ko and tries not to look too smug in the process. 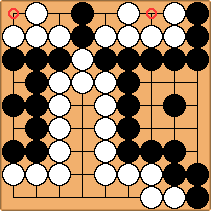 White effectively loses a point because of the forced pass, and black wins by 1.5 points. To summarize: under area scoring the final ko is worth extra if there are no dame left. Thank you all for the answers. I have to admit, I was only a little curious at first, but this has turned out to be more interesting than I would have imagined.